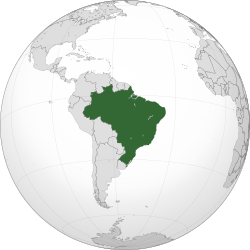 Brazil (pronounced /brəˈzɪl/ (deprecatit template); Portuguese: Brasil, IPA: [bɾaˈziw]), offeecially the Federative Republic o Brazil (Portuguese: República Federativa do Brasil, listen (help·info)), is the lairgest kintra in Sooth Americae. It is the warld's fift lairgest kintra, baith bi geographical aurie an bi population wi ower 190 million fowk. It is the anerlie Portuguese-speakin kintra in the Americas an the lairgest lusophone kintra in the warld. Bundit bi the Atlantic Ocean on the east, Brazil haes a coastline o ower 7,491 kilometers (4,655 mi). It is bordered on the north bi Venezuela, Guyana, Suriname an the French owerseas depairtment o French Guiana; on the northwast bi Colombie; on the wast bi Bolivie an Peru; on the soothwast bi Argentinae an Paraguay an on the sooth bi Uruguay. Numerous archipelagos form pairt o Brazilian territory, sic as Fernando de Noronha, Rocas Atoll, Saunt Peter an Paul Rocks, an Trindade an Martim Vaz. It haes borders wi aw ither Sooth American kintras apairt frae Ecuador an Chile. ↑ "IBGE | Sala de imprensa | notícias | IBGE releases the population estimates of the municipalities in 2012". Saladeimprensa.ibge.gov.br. Retrieved 2013-06-04. ↑ 5.0 5.1 5.2 5.3 "Brazil". International Monetary Fund. Retrieved 2014-02-08. Wikimedia Commons haes media relatit tae Brazil. This page wis last eeditit on 1 Januar 2019, at 19:14.